The December 2016 incident involving a U.S. unmanned underwater vehicle (UUV) was neatly wrapped up on December 20 after China returned the vehicle. Despite diverging legal interpretations, the management of the event reflected the political willingness of both countries to keep the South China Sea dispute under control and in a careful balance so that the situation does not escalate into a military confrontation. However, whether this balancing act might continue in the Trump administration remains to be seen. The debate on the presence of the U.S. Coast Guard (USCG) in the South China Sea might add to this uncertainty. Nevertheless, we should not be too pessimistic about the future of the U.S.-China relationship in the region given the existence of shared interests, crisis-management mechanisms, and interactive military relations. The legal debate that arose during the UUV incident focused on three aspects: the legitimacy of the Chinese action, whether the UUV enjoyed sovereign immunity, and the legal status of the location where it was seized. First of all, the Pentagon said that the UUV had been “unlawfully seized.” China defended its action as having been taken “in order to prevent the device from causing harm to the safety of navigation and personnel of passing vessels.” Second, the Pentagon stated, and James Kraska and Raul Pedrozo argued in depth, that the UUV is a “sovereign immune vessel of the U.S. Navy which was conducting routine operations in the international waters of the South China Sea.” The opposing argument relates to the legal question of whether the “sovereign immunity” provided in Article 32 of the United Nations Convention on the Law of the Sea (UNCLOS) extends to drones or any other equipment deployed from state vessels. Third, the location where China seized the UUV was referred to by the United States as “international waters,” in which it claims to enjoy unrestricted rights to exercise freedom of navigation. From the littoral states’ perspective, however, this location is within the exclusive economic zone (EEZ) of the Philippines, a maritime zone in which the scope of freedom of navigation does not necessarily equal the freedoms that Article 87 of UNCLOS provides on the high sea. The divergent legal interpretations of the UUV incident are only a small part of a much larger debate about the legitimacy of military activities in a foreign country’s EEZ, which is a long-standing legal question that has divided China as a coastal state and the United States as a user state. The divergence covers interpretations of key UNCLOS concepts, including “freedom of navigation,” “innocent passage,” “peaceful use of the ocean,” and “due regard.” The two countries have carefully managed their differences in a way that reflects their respective national interests without triggering the nerves of the other. In 2016 the United States increased the frequency of its naval patrols in and outside the 12 nautical-mile zones of the Spratly and Paracel Islands under the name of innocent passage and freedom of navigation, without challenging China’s sovereignty claims. Compared with its strong reaction to the 2001 EP-3 incident and the 2009 Impeccable incident, during which a pronounced nationalism dominated public discourse, China reacted with low-profile official protests, without objecting to the doctrine of freedom of navigation itself. The behavior of the United States and China reflects the political willingness of both countries to keep the South China Sea dispute under control and to enhance maritime cooperation despite these divergent views. Whether this balance might continue during the Trump administration is not yet clear. During his confirmation hearing, Secretary of State Rex Tillerson took a tougher stance against China’s presence in the South China Sea. He contested China’s territorial claims, saying that its “access to those islands [is] not going to be allowed.” Recently, however, Secretary Tillerson has reportedly pushed President Donald Trump to reaffirm the one-China policy after he had indicated that it should be reconsidered. Secretary of Defense James Mattis also seems to be eager to walk back the rhetoric a little, suggesting during his inaugural trip to Tokyo that there is “no need for dramatic U.S. military moves in [the] South China Sea.” At the same time, however, Steve Bannon, the appointed senior counselor to the president, said “there is no doubt” that the United States is “going to war in the South China Sea in 5 to 10 years.” Sean Spicer, Trump’s White House press secretary, claimed that “we’re going to make sure that we defend international territories from being taken over by one country.” Notably, the words “freedom of navigation”—the linchpin of Obama-era declamations of U.S. interests in the South China Sea—did not appear at the briefing. Whether this signaled a sharp departure in the U.S. approach to handling China’s territorial claims at sea remains to be seen. All these comments from key members of Trump’s foreign policy team suggest an uncertain U.S. policy in the South China Sea. In addition to the uncertainty and unpredictability of the Trump administration’s policy, the debate about the presence of the USCG in the South China Sea might be another point of friction between the United States and China. On November 29, 2016, Admiral Paul Zukunft, the USCG commandant, spoke at the Brookings Institution about sending USCG ships to the South China Sea to maintain regional order. From the U.S. perspective, as USCG vice commandant Charles Michel has argued, there is reason to think that China might respond more positively to USCG white hulls than U.S. Navy cruisers and destroyers, and that the coast guard can more easily maneuver the “narrow door of diplomacy.” However, the argument that the USCG should have a more visible presence in the South China Sea highlights a misunderstanding about coast guard roles and thereby potentially increases the risk of conflict with China and possibly other claimant states, especially Indonesia and Malaysia. 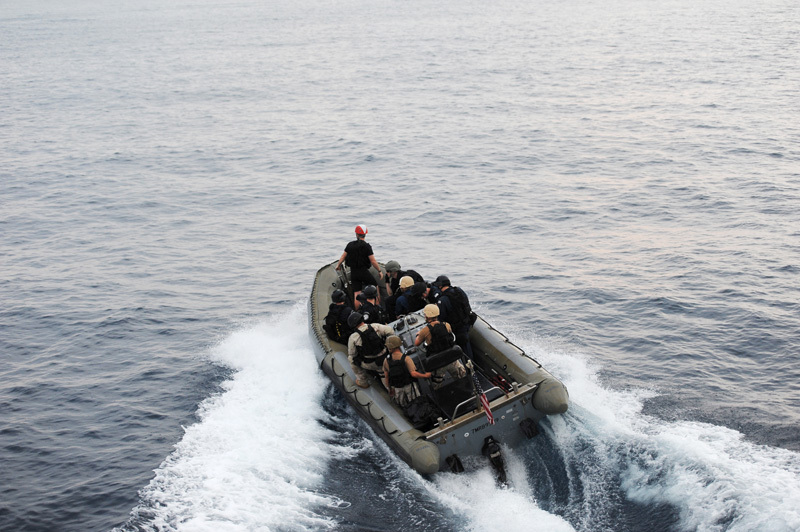 U.S. Navy and U.S. Coast Guard boarding team members on board a RHIB boat on March 3, 2013, in international waters near Colombia and Ecuador, in the Pacific Ocean. Jose CABEZAS/AFP/Getty Images. In addition, if the USCG’s presence in the South China Sea aims, as the USCG commandant claims, at working with coast guards of regional allies and partners to enforce those countries’ laws, this is also legally problematic. This is a problem of international rather than domestic law: U.S. experts have suggested in Track 2 settings that USCG activity in the South China Sea is not prohibited by domestic law, and in any case Congress would likely ratify this proposal if doing so would enhance the security of maritime trade routes. However, to conduct law-enforcement activities, such as boarding fishing boats on behalf of regional partners, the USCG would need the authority and jurisdiction to operate in relevant waters. This would likely be worked out through bilateral agreements with relevant countries, which would require recognition of those countries’ territorial claims—something the United States has been unwilling to do so far. Likewise, even in uncontested waters that fall within the absolute sovereign control of a coastal state, critics of the USCG will argue that a foreign state’s law-enforcement activities will impinge on the sovereignty and jurisdiction of the coastal states, which has been a long-standing concern for some countries in Southeast Asia. Strong opposition from Malaysia and Indonesia to the Regional Maritime Security Initiative proposed by Admiral Thomas Fargo, the former U.S. Pacific commander, is a typical example. Hence, it is very likely that the USCG’s contributions in Southeast Asian waters will be limited to capacity building, without extending into active law enforcement. All these recent developments suggest that the competition between China and the United States will become a salient feature of the geopolitics of the South China Sea. One of the root causes is the structural contradiction between an established power and an emerging one, encompassing competition for geopolitical strategic advantage, sea power, and dominance over the international order in East Asia. This competition will continue to intensify as a result of China’s rise and the United States’ comprehensive strategic adjustment in the Asia-Pacific. Although the Trump administration has not yet clearly expressed its South China Sea policy, from the perspective of some Chinese analysts the United States has sent signals that it will bolster its military presence in the region. Even after Secretary Mattis softened his position, China does not seem to take this as persuasive due to the uncertainty inherent in Trump’s Asia policy. The Navy Times reported on February 12 that “the Navy is planning fresh challenges to China’s claims in the South China Sea,” which would be a clearer indication of the Trump administration’s future policy direction than the statements currently offered by top officials. 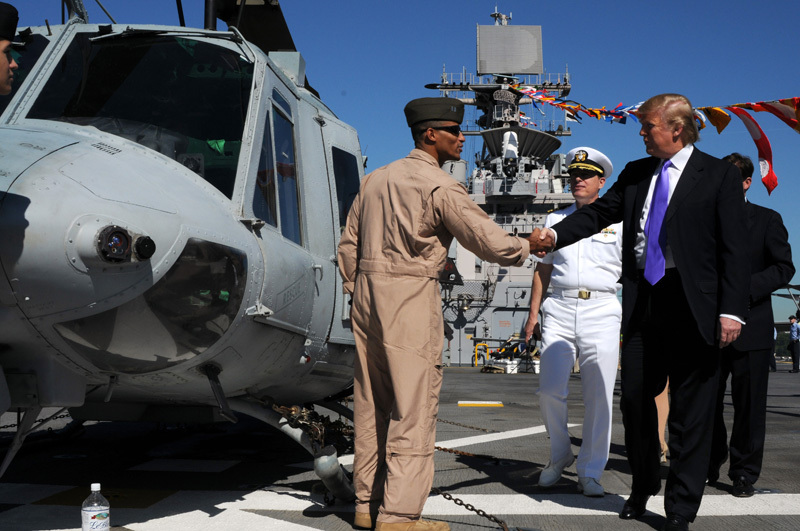 U.S. President Donald J. Trump, at the time chairman and CEO of the Trump Organization, tours the flight deck of the amphibious assault ship USS Iwo Jima (LHD 7) in New York City on May 21, 2009. U.S. Navy/Mass Communication Specialist 3rd Class David Danals. Despite the above illustration of a worst-case scenario, we should not be too pessimistic about the future of the U.S.-China relationship in the South China Sea. 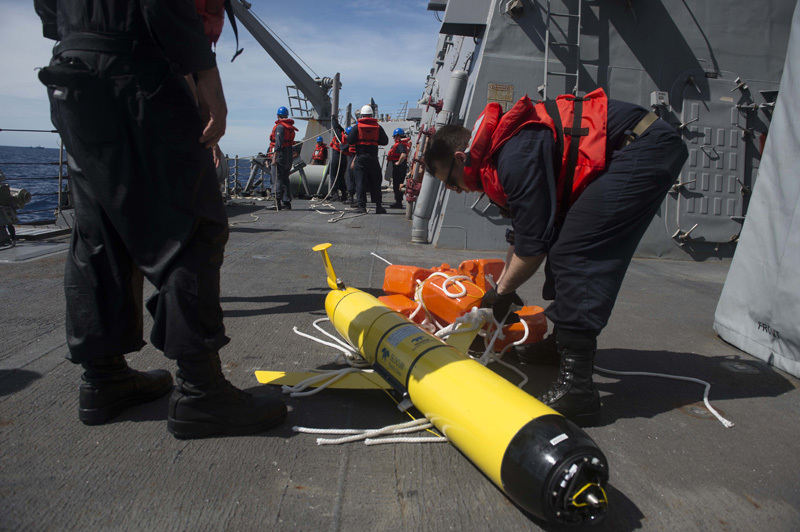 The UUV incident could not have been resolved in six days without the prior military trust-building efforts made by both countries. Both sides have learned from the 2001 EP-3 incident, the 2009 USNS Impeccable encounter, and the recent underwater drone incident how best to manage crises at sea. Current crisis-management mechanisms between the two countries—such as the memoranda of understanding (MOU) on “Notification of Major Military Activities” and “Rules of Behavior”—are playing a crucial role in dealing with emergencies and preventing the escalation of tensions arising from unplanned and unwanted incidents at sea or in the air. China and the United States should seek to preserve good faith and a positive spirit in their military relations, despite the divergence in their legal views on maritime issues. As far as the South China Sea dispute is concerned, they should maintain interactive military relations in order to guard against misjudgment, reduce confrontation, and manage and control crises. Both countries should endeavor to avoid escalation stemming from confrontations or tensions triggered by frequent U.S. freedom of navigation operations or the Chinese construction of military facilities on the reclaimed features in the Spratly Islands. China and the United States share interests in maintaining peace and stability in this region and further enhancing maritime cooperation on nontraditional security. The benefits of such efforts should not be underestimated and call for both countries to remain calm, guard against misinterpretation, and expand channels for military exchange and communication. Both countries should also advance existing crisis-management mechanisms based on the principles of the U.S.-China Military Maritime Consultative Agreement and the two MOUs signed in 2014 so that such mechanisms can play a greater role in the future. Nong Hong is Executive Director of the Institute for China-America Studies and a Research Fellow at both the National Institute for South China Sea Studies in China and the University of Alberta in Canada. Banner Image: © U.S. Navy/Mass Communication Specialist 1st Class Nathan Laird. U.S. Chief of Naval Operations Adm. John Richardson meets with Adm. Wu Shengli, Commander of China’s People’s Liberation Army Navy, in Beijing on July 18, 2016.